Said organizer Jay Sivakumar, a BA candidate at the University of Windsor, the four-by-two foot murals will focus on social issues. “We are hoping to have youth construct murals which address issues such as barriers to social inclusion that can be conveyed through politically-influenced murals that identify systemic issues,” he said. 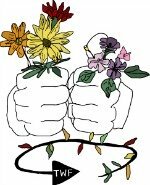 Sivakumar also represents a group known as Together We Flourish and its community garden, located at the Islamic Centre at 5420 Empress St., the logo of which shows two fists clenching flowers. By doing so it will create a,” safe space,” he said. The contest deadline is May 17th which coincides with a community block party. Sivakumar said some local high schools are also participating. Sivakumar and co-organizer Lina Chaker received funding from the Toronto-based Laidlaw Foundation. The Laidlaw Foundation dates from 1949 and is named after the founding family, owners of the former Laidlaw Lumber Co., sold to Canadian forestry giant MacMillan-Bloedel in 1972, in turn sold to US-based Weyerhaeuser in 1999.